When Aurora was growing up in communist Romania, before the 1989 revolution, many foreign books were hard to come by. Her introduction to the genre of science fiction was what she’d later remember only as “that book with the purple cover that I really liked when I was small”. Despite the rather vague description, Aurora’s mom managed to dig out the book twenty years later, probably from a dusty bottom shelf of the family library, or from behind a row of more recently acquired western literature. On the front page, there is a handwritten note dated June 18, 1967, awarding this book to Aurora’s father as a prize for finishing that school year with the highest grade point average in his class. This book, called “The last orbit” by not-so-famous Belarusian author V. Shitik, describes the adventures of a manned mission that was planned to land on Mars and then continue its journey, bringing the cosmonauts onboard all the way to Pluto. Two years, one month and two days after Aurora’s father was given this book by his school teacher, Neil Armstrong and Edwin (Buzz) Aldrin became the first humans to walk on the Moon, opening up a world of possibilities in which V. Shitik’s stories looked to become more than mere science fiction. Sputnik 1, the first artificial satellite successfully launched in orbit around the Earth by the Soviet Union in 1957, marked the beginning of one and a half decades during which humans’ dreams of breaking loose from the relentless pull of Earth’s gravity were coming true one by one. Four years after Sputnik 1, Yuri Gagarin became the first human to journey into outer space, completing an orbit of the Earth with the Vostok spacecraft on April 12, 1961. And it only took about eight more years until the first people landed on the Moon. Within the short span of three and a half years, between July 1969 and December 1972, a total of 6 missions brought 12 people successfully to the surface of the Moon – until the Apollo program was canceled, marking the last time any human has set foot on solid ground other than Earth. People leading the space exploration efforts soon realised that sending people on an interplanetary journey will be way more difficult and expensive than traveling to the Moon. With our current propulsion technology, a one way trip to the Moon lasts 3 days, while a one way trip to Mars would last at least 8 months. A return trip that would include landing on Mars would take 3 full years! And it’s not just the length in time that makes this trip difficult and dangerous. Interplanetary travellers will have to carry all their food, water, and clean air. They will have to be very skilled in recycling, and maybe grow some of their food inside the spacecraft. They will have to keep exercising so that they do not to lose muscle and bone material by spending such a long time in zero gravity. They will be exposed to cosmic rays, risking cancer due to high radiation levels. Travellers to Mars will feel very lonely, with the Earth looking like a tiny faraway dot in the blackness of space, and with communication with Earthlings made difficult by the distance. It will take first seconds, then minutes, and eventually as much as 20 minutes until a radio message sent by them arrives on Earth – and the same amount of time until the reply from the Earth arrives back. Nonetheless, many people are tempted to go on such a voyage, because exploration is part of the human nature: already more than 500 years ago, explorers braved the treacherous oceans on wooden ships to discover faraway lands, on journeys that were often just as risky, lengthy, lonely, and difficult. To acquire the skills necessary for long term space travel, after the Apollo Moon program was over, both Americans and Soviets focused their efforts on building a space station. Today, astronauts from all around the world are gaining experience in living in space by working on the International Space Station, a huge laboratory with a permanent crew of six, orbiting 400 km above the Earth’s surface. 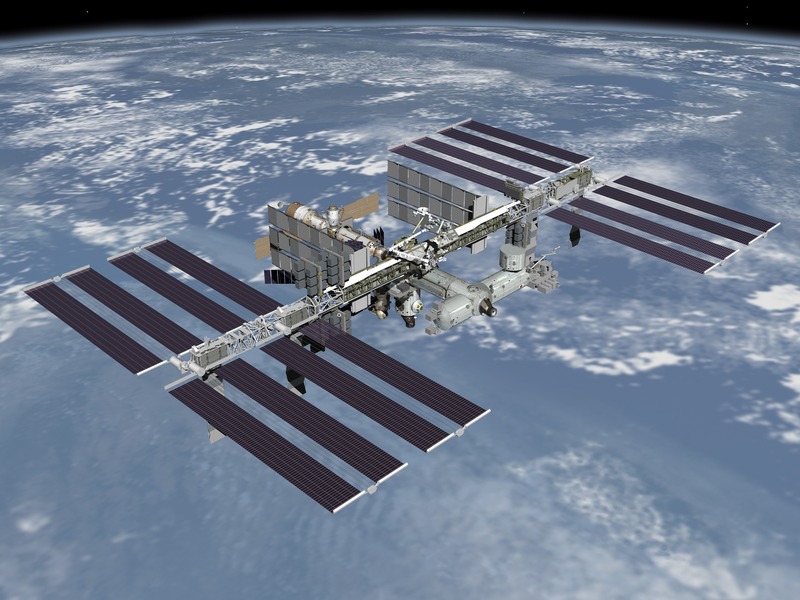 A view of the International Space Station. Credit: NASA. Even though humans haven’t traveled further than the International Space Station in over 40 years, things may soon change. In the next decade, NASA is planning to send human explorers to study an asteroid. Asteroids are small rocky bodies, some as little as ten meters, others as big as hundreds of kilometers across. Some of them come close to Earth from time to time, which makes them potentially dangerous, but also easier to get to. This makes them the best stepping stone towards a more complex journey to Mars. One of the goals of the explorers sent to an asteroid will be to study its properties so that, if we discover such a body on a collision course with our planet, we will be better prepared to deal with it – so we don’t share the fate of the dinosaurs, who were probably wiped out after a 12 km sized asteroid hit the Earth 65 million years ago. In addition to that, private companies such as Planetary Resources, are already interested in exploiting asteroids as sources of minerals that are essential for the modern industry but are rare on the Earth. In fact, private companies, such as SpaceX, Sierra Nevada Corp., or Virgin Galactic, are already getting involved and making progress toward providing more accessible human spaceflight. They may soon take over the initiative from the large government space agencies such as NASA. If the rather ambitious plans of some private explorers are fulfilled, the first human explorers will fly around Mars even before NASA launches its first asteroid-bound crew. A private initiative called Inspiration Mars, led by the first space tourist Dennis Tito, is planning to send a married couple to fly around Mars and back, departing as soon as 5 years from now. Even though the crew would not land on Mars, such a mission would be extremely valuable. It would test and demonstrate the technological, physiological, and psychological aspects of a journey to Mars and show that long interplanetary travel is indeed possible. Some people, such as Buzz Aldrin, have long argued that the human exploration of Mars should start with the first travellers going on a one way trip and building a long term base, which could prove cheaper and easier than a round-trip ticket. A private initiative called Mars One is planning to send the first explorers on a one way trip already in 2022. And it seems that many people are willing to go: already 100,000 people signed up for the journey. Even if these first initiatives will get delayed, and many will fail, it seems likely that the future space exploration efforts will be driven by private companies, instead of the big space agencies which led the way in the past century. Meanwhile, until humans venture into interplanetary space, robotic spacecraft have given and will continue to give us a close look at almost all of the larger bodies in the Solar System. Robots are a lot more resilient to space travel than people – they don’t need food, water, clean air, they don’t suffer from cancer due to high radiation levels, and they don’t have even the smallest psychological difficulty with spending decades isolated in a tiny capsule. So far, robots have successfully landed on Mars, Venus, Saturn’s moon Titan, asteroids Eros and Itokawa, and have penetrated deep down into Jupiter’s atmosphere. NASA’s Curiosity rover, which landed on Mars last year, weighs more than a metric ton, or approximately the size of a small car like a VW-Beetle, making it the largest robot that ever landed on another planet. Putting this huge robot down safely on the surface of Mars required quite a bit of creativity and technological development. Rocket engines helped the spacecraft that Curiosity was riding on hover above the surface, while a sky crane lowered the rover gently onto the ground. This was a very bold and risky maneuver, but its success proved our ability to put down big things onto the martian surface, possibly including the homes of human explorers in the future. Curiosity is mobile and can travel around on the surface of Mars. It has excellent 3D vision, with stereoscopic cameras mounted on a high mast. It has a small laser gun, with which it can evaporate rocks so that it can study their composition. And it can even drill into the rocks and look at what’s under the surface. So, sending Curiosity to Mars is the next best thing to sending a well trained geologist, with all the perks of a good laboratory. Next to a virtual geologist, we have also sent lots of virtual photographers into interplanetary space, which sent back close-up pictures through different kinds of cameras from every planet in the Solar System, not counting Pluto. The man-made objects that have traveled the furthest from the Earth until now are the space probes named Voyager 1 and 2, launched by NASA in 1977, which are on the edge of interstellar space as we speak – and still going strong after more than 35 years. They both carry phonograph records containing sounds and images that depict life and culture on Earth, like a message in a bottle for any intelligent life form who might find them a long time from now. Another spacecraft on the way to the edge of the Solar System, called New Horizons, is on track to partly fulfil the dream of the Belarusian author V. Shitik. This plutonium powered spacecraft will reach Pluto, its large moon Charon, and a suite of at least four other tiny moons, in two years’ time – and then continue towards even more distant bodies in the so-called Kuiper Belt. We may soon discover that these worlds at the edge of the Solar System, which sci-fi authors dreamed and wrote about, are actually interesting dynamic bodies with ice-volcanoes, snow, and thin atmospheres that periodically freeze and snow down to the surface, then evaporate again. For now, our robots are doing a great job in exploring the Solar System. But human explorers will one day, no doubt, follow. Tagged Apollo program, Buzz Aldrin, Curiosity rover, Inspiration Mars, International Space Station, Mars, Mars One, Moon landing, Neil Armstrong, New Horizons, Planetary Resources, SpaceX, Sputnik 1, Virgin Galactic, Vostok, Voyager, Yuri Gagarin. Episode 4 clearly needs some updates: fix the ISS picture link; update New Horizons results, update Curiosity results and include the latest NASA planning for a Mars manned visit. Still an interesting article, thanks.